Re: Look what I can do! The only orange/brown GT500 KR sold at Schmidt Ford, aka the Coralsnake! An incredible piece of documentation! How long have known this? That’s a lot of KRs ! !How many did they sell in total at that dealership? I'll have to scour The Sun for my blue, brown trim 500. Good week for both of us as I got a picture of my car from the previous owner this week too. What a great item to add to your car's documents. I just love those vintage ads! How do you research old news papers for the 60's? I've always wanted to do this but never knew how. You can go to the state library and look at what they have archived. There are also antique dealers that specialize in print. Whitings Old Paper is just up the street from me and, along with magazines, he has a lot of original Richmond area newspapers on hand. He also has a nice selection of vintage NASCAR racing programs. They are several ways to do it. The state library might be one resource. It cost 19.00 for a months access. Make sure you change your settings after you sign up to stop the auto renewal. I have a list of the newspapers each dealer used. If you are looking for a specific dealer the newspaper has to be in the database. 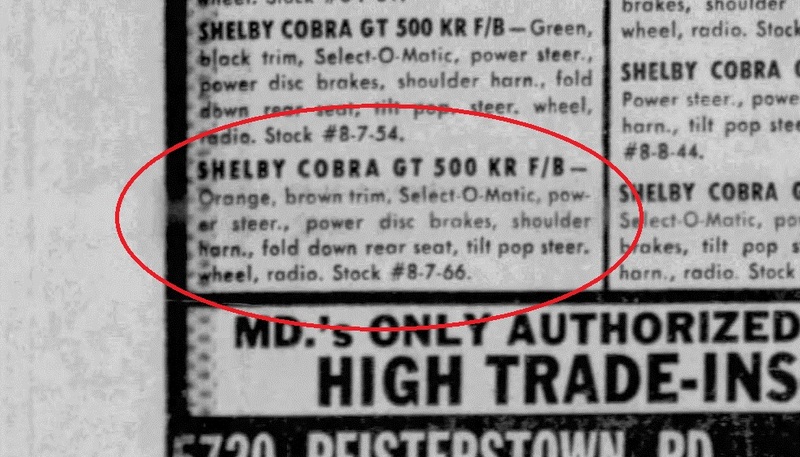 I think I used 1965-1970 for the date range and “shelby dealer” for the search terms. If you get too many search words it wont work as well. I have gathered several dozen dealership ads from various dealers. Very cool! 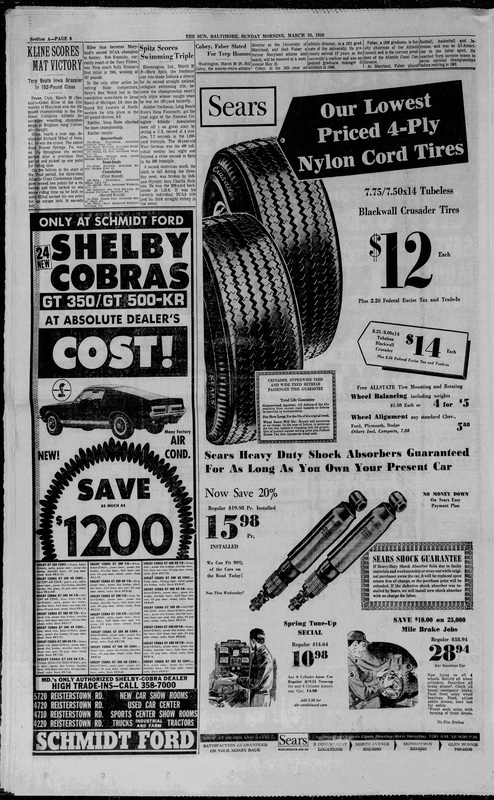 $12 tires and an article on Mark Spitz as a Freshman NCAA swimmer along with a page full of GT350's and KR's at dealer cost.